To run python application in docker, we need to create Dockerfile. This application involves the following steps. It is require to create Docker image. It contains instructions that are read by Docker. Create a python file to execute in the Docker container. To create Docker image of this python application, we need to use the following Docker command. 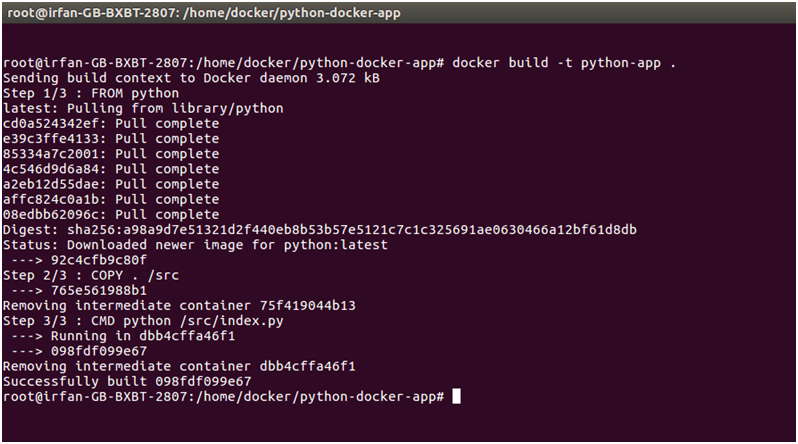 $ docker build -t python-app . We can see all the available Docker images by the following command. After creating docker image, now we can run it by using the following command. The above command runs the Docker images and executes the python file. After executing, it produces the output which is shown in the above image.